Delft, Netherlands – July 21, 2008 – OCZ Technology Group, Inc. (LSE: OCZ), a worldwide leader in innovative, ultra-high performance and high reliability memory and PC components, today announced the first memory modules available in their Fatal1ty Series after the partnership was announced last month. 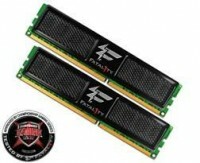 These high-performance memory kits were co-developed with the expertise of Johnathan “Fatal1ty” Wendel, 12-time World champion, to meet the specific needs of fellow gamers. OCZ Fatal1ty Professional Series kits are the official memory modules of Championship Gaming Series (CGS), and feature incredible performance to power through the latest PC titles and contribute to the success of professionals and everyday gamers.